This compilation is the one everybody needs. 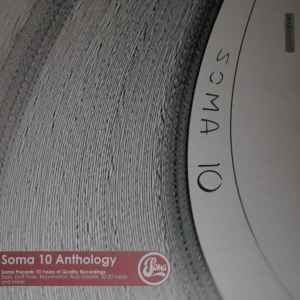 From house (Scott Grooves, Daft Punk)to techno (Percy X, the amazing Skintrade) to classics (Slam, Rejuvination...), you should buy this double to remember how good this label sas in the 90's and how innovative was SOMA. This is just very good music made with love to give us lots of special mental sensations. Without it or all the ep's, your collection is empty ! All tracks are great, really. Thanks to Orde and Stuart (=Slam) ! This collection really opened my eyes to some classics. I bought it for Da Funk and Positive Education but ended up loving the lot. some classics on this album, brilliant release from a brilliant label, some versions of the album (it has 2 different covers - but the same cat no) have the "hidden treasures" mix (from the cd release) in a cardboard sleeve included.